Hi everyone! I made this card to enter into our county fair. 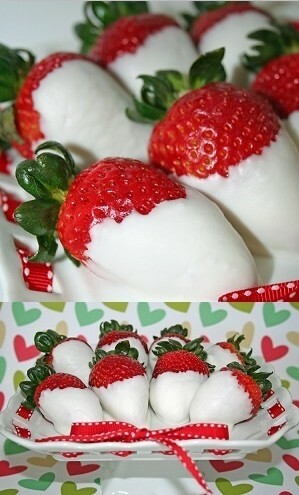 I have to take it there tomorrow (Thursday) and just made it tonight. The category is paper tole. I looked it up and the definition is taking parts of the same image and popping it up. I can do that! The problem was finding the right stamp (of which I have many!)! So I chose this Miss Peggy stamp from High Hopes. 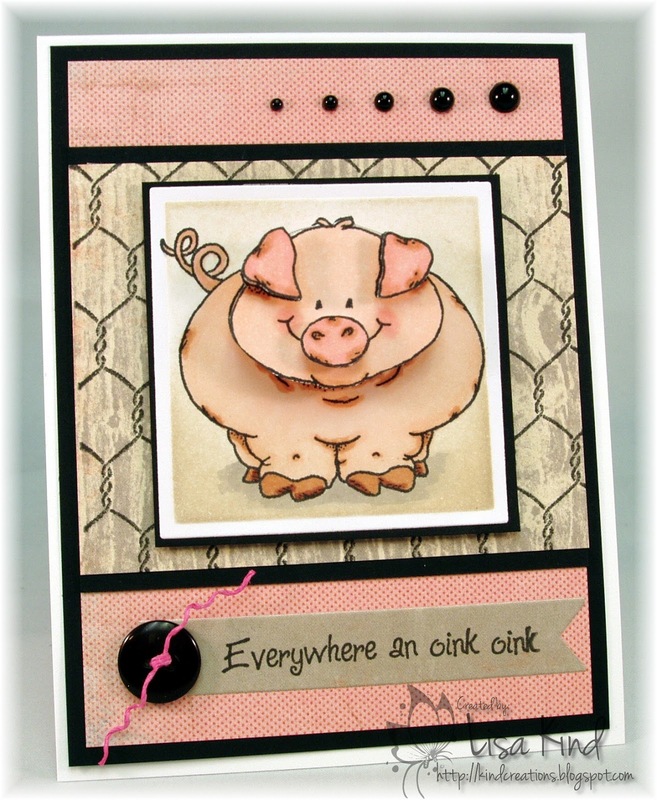 I stamped it three times on X-Press It Blending Card and cut out the head from one and the nose and ears from another. The head is actually on one of those wobble things, so it moves. Th﻿e image is colored with copic markers. 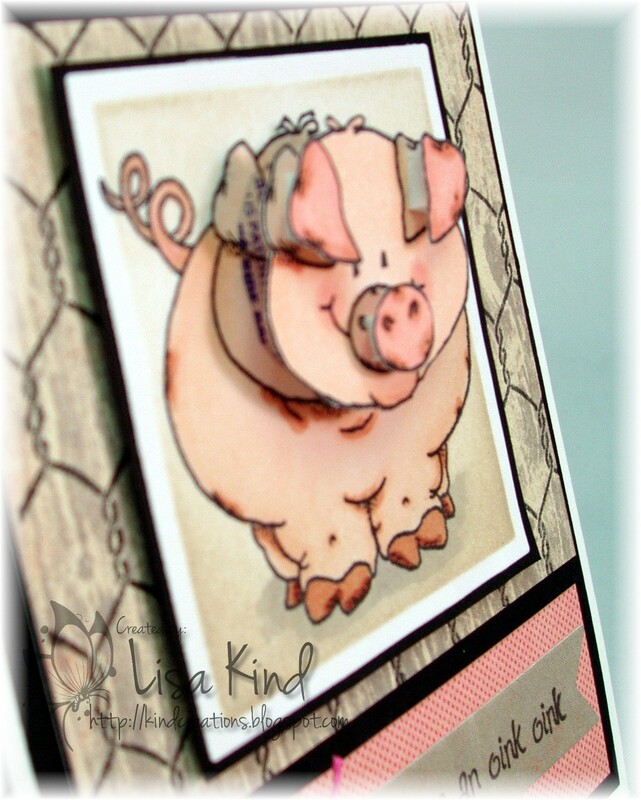 I stamped the chicken wire (from a company called Stamp Camp) onto a wood grain paper from Authentique. 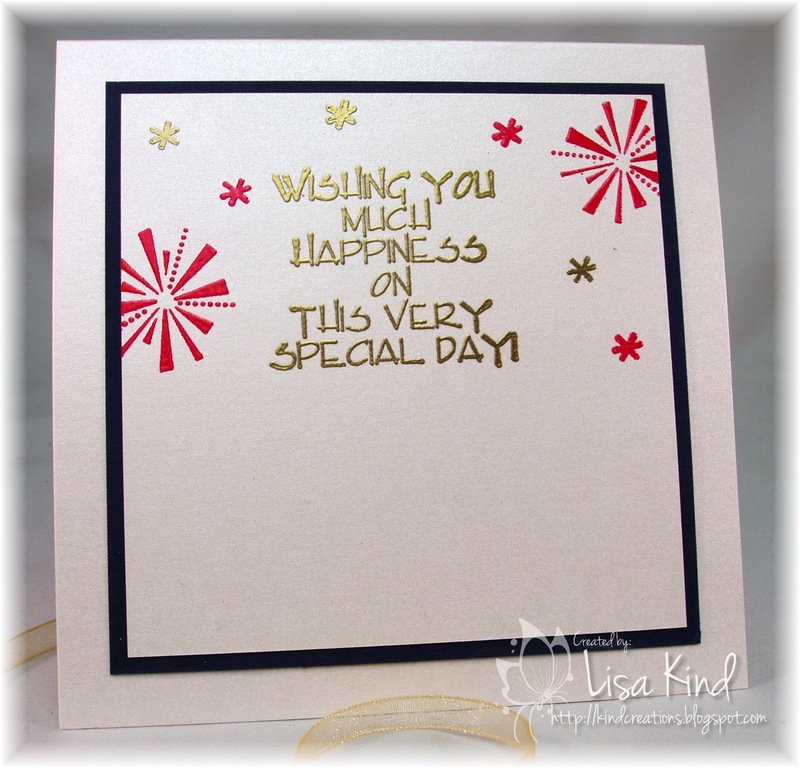 The sentiment is also from High Hopes and I stamped it on the backside of the woodgrain paper. It's cut with a WPlus9 flag die. I accented the card with a button strung with some floss and some pearls. Here's a blurry side view. The only thing I don't like about that wobble thing is that the back side of it has writing on it. Can you see it? How dumb! I hope I get some recognition at the fair! If not, it was fun creating this one! Thanks for stopping by! Happy Sunday! I went to a graduation party yesterday for my husband's cousin's daughter (follow me?). 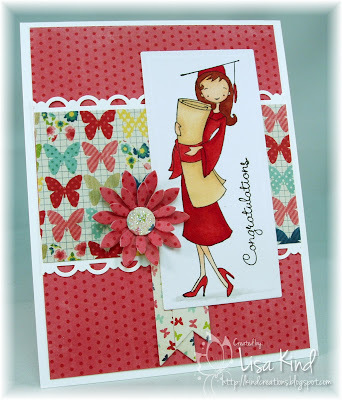 This Grad Girl stamp set from My Favorite Things is the only graduation set I have. I actually cased myself with this graduation card I made for my niece. Hope you like it! I went kind of literal with my card. 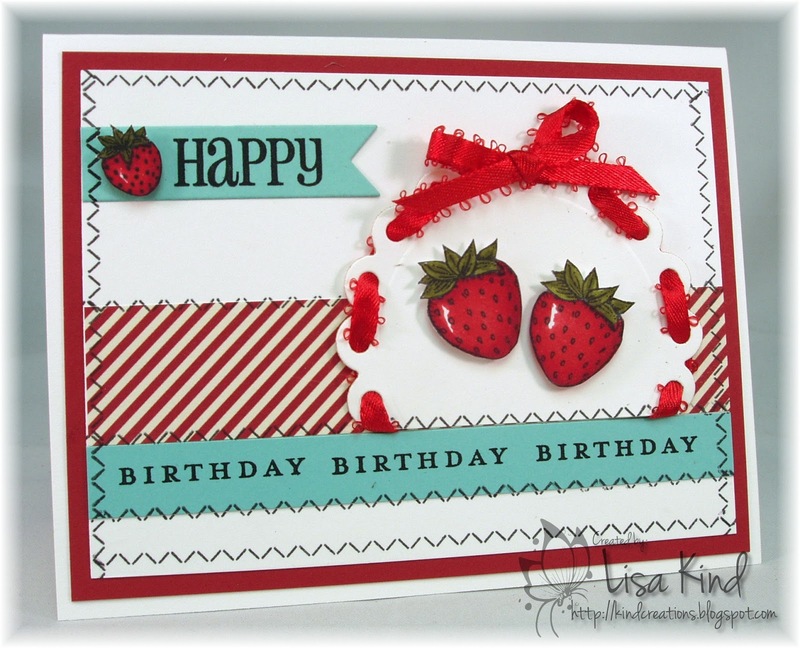 I used strawberries, of course, and the colors as my inspiration for the card. 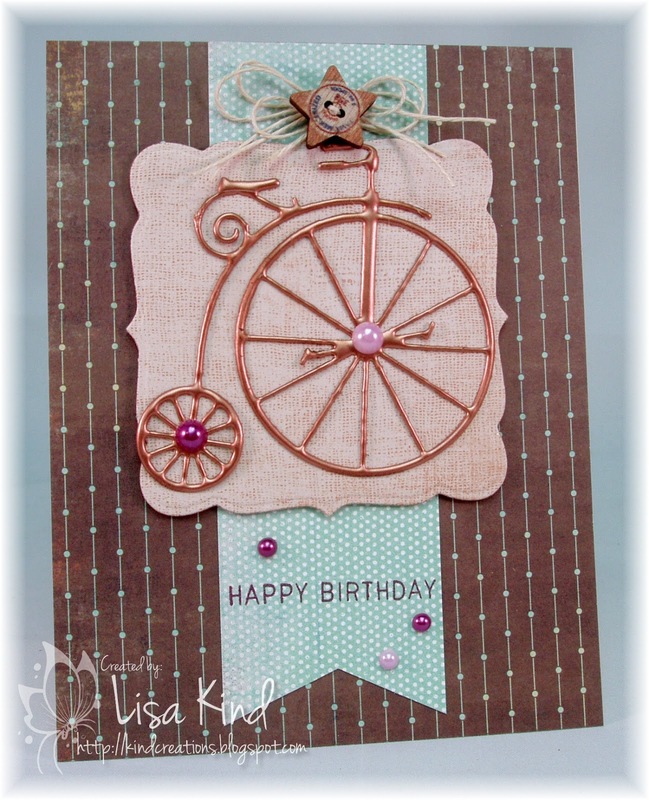 I used so many different materials and stamps on this one little card! I'm not good at sewing on cards...bobbin problems always! 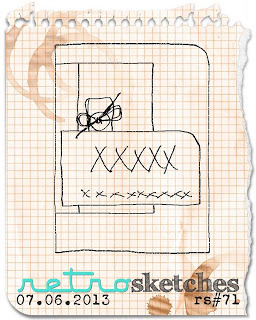 So I bought this little set from Papertrey﻿ Ink called Sew Simple Borders so I could cheat! I also wanted to add some Crystal Effects to the strawberries, but the nozzle was clogged and I couldn't get it to come out! I guess it looks fine without it! 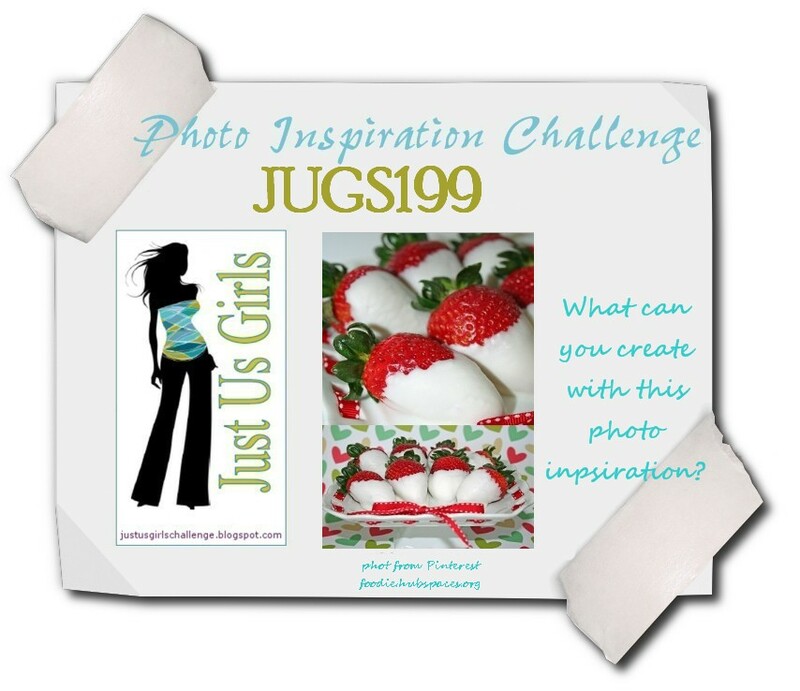 Stop by these blogs to see what the JUGs design team created with this photo inspiration. Hi everyone! I'm enjoying my summer because I have some time in the morning to craft! Can't do that when you are working! 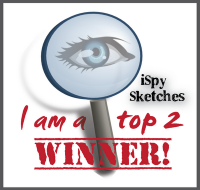 I'm taking the Summer Card Camp 2 from Online Card Classes and I have a card for yesterday's class. It was all about die cutting techniques. 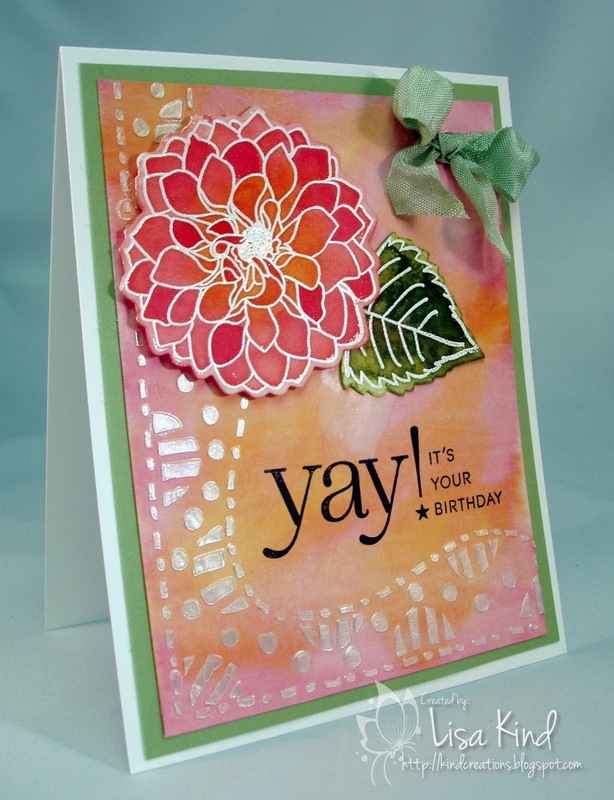 Jennifer McGuire used a pretty and detailed die that she repeatedly embossed. I don't think I've ever done that, so I tried it. 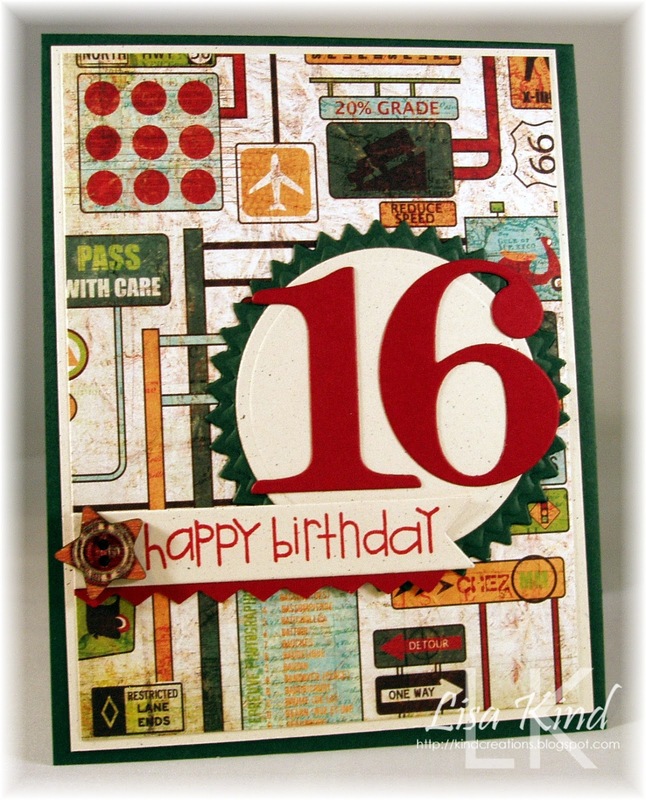 And Nichol Magouirk made a card I loved, so I cased it. Hi everyone! I'm taking the Summer Camp 2 from Online Card Classes and I was finally able to participate in one of their classes! Of course I had to pick the one with the most difficult color challenge! It was two shades of brown, two shades of purple, and a light blue. Difficult, right? 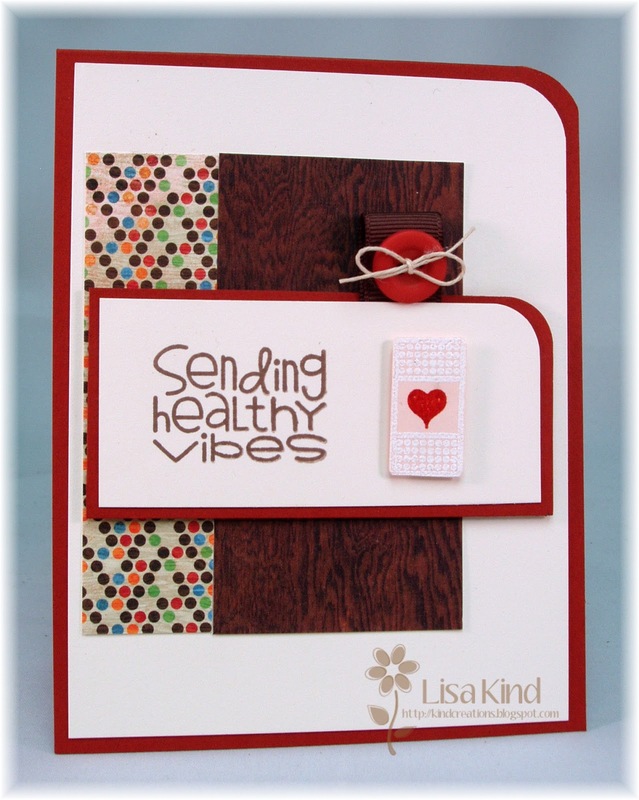 Well, yesterday's class was mainly about how to incorporate a difficult color challenge into an eye-pleasing card. I don't know if I accomplished that, but I sure tried! LOL! So here's what I came up with. We were given this color challenge and three sketches to choose from. I liked this angled one. It allowed me to use the new Rainbow Stripes die from Papertrey Ink. It actually has 5 stripes, but I only used the three. I cut them from Lovely Lilac (the lighter purple) and one from a scrap I had so I don't know the color, but it worked for me! The bottom half of the card is Aqua Mist and I matted the whole panel onto Chocolate Chip. The base of the card is the new SU color Baked Brown Sugar. Not sure I'm loving those last two colors with this card, but I went for it! The sentiment is from PTI's Sunflower Bouquet and it's stamped in Chocolate Chip. (I recently had to purchase a new CC stamp pad...not sure I'm liking their new ink pads!) I finished it off with some purple bling nestled in some sequins on the bottom and some more bling on the top. Kind of plain, it needs something else, but I spent enough time on it so I left it! Happy Saturday! It's time for another color challenge from Just Us Girls! Tangii is our hostess and she chose this wonderful picture as inspiration for the colors. I used Marina Mist, Blushing Bride, Pixe Pink, Crisp Cantaloupe, and Tangerine Tango papers and ran them through the Xyron machine. 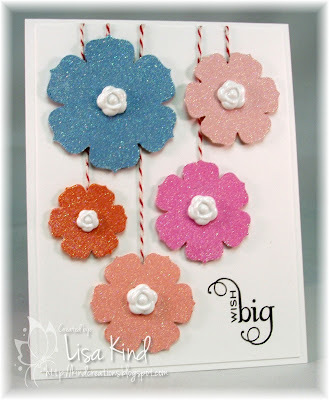 Then I poured Glitter Ritz Cool Highlight glitter on top of each flower. I then added the baker's twine and a plastic white rose (from Hobby Lobby in the center of each bloom and popped them up on dimensionals. 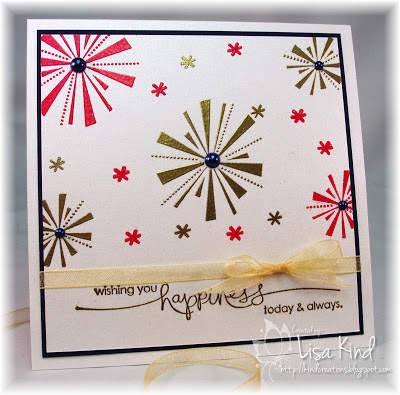 The sentiment is from Star Prints by Papertrey Ink. 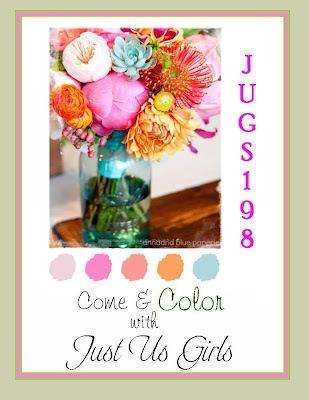 Stop by these blogs to see what the girls did with these fabulous colors! Hi everyone! How's your summer going? I spent most of the day with my mom at the mall to stay cool! I don't mind the heat, but I hate the humidity! Does nasty things to my hair! LOL! But I did squeak some time in my cool basement to make a card for A Mixed Media Color Challenge. Hi everyone! 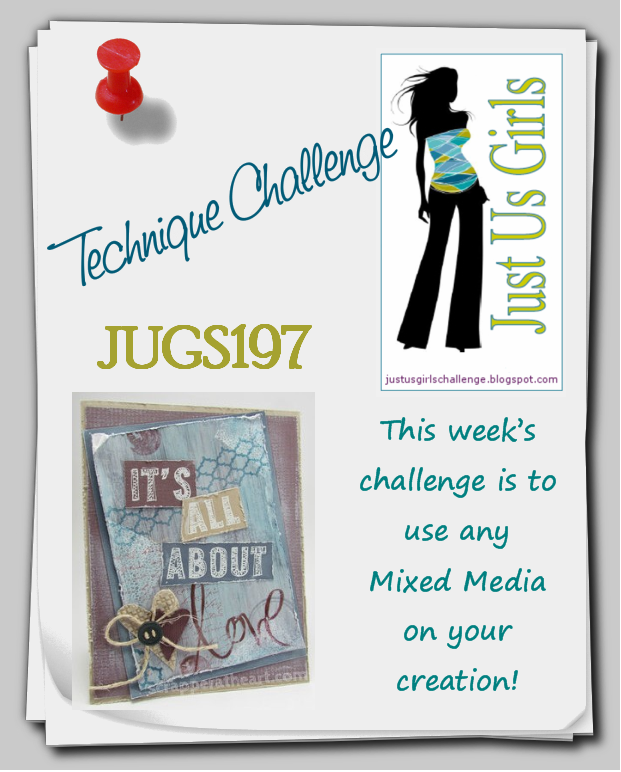 It's technique week over at Just Us Girls and Maria chose a challenge that really intimidated me until I sat down and tried it! 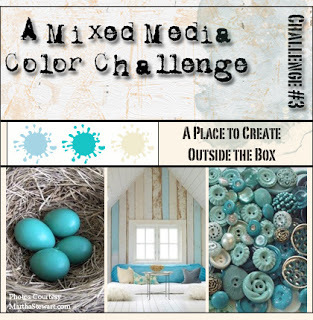 This week we are using Mixed Media as our challenge. 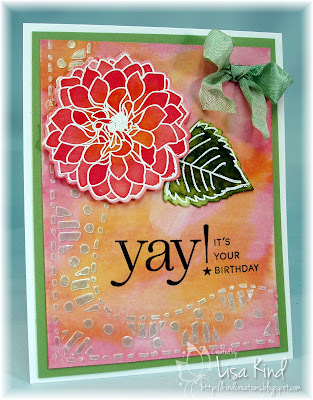 She found this great video over at Splitcoast Stampers for you to watch and to be inspired. 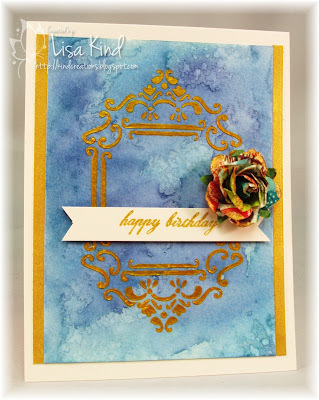 I watched this video along with several others, including videos from Tim Holtz and Jennifer McGuire. Jennifer did a flower similar to this and I loved it and stared there. The flower is from Papertrey Ink's Delightful Dahlia set. 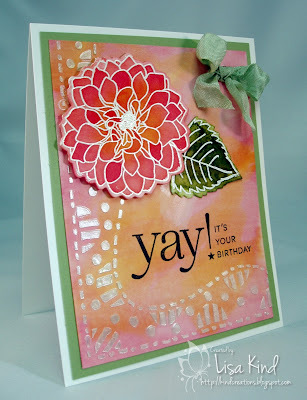 I stamped it in Versamark on watercolor paper then heat embossed it with white ep. I applied Spiced Marmalade and Worn Lipstick distress stains, and spritzed it with water to help move and puddle the inks. I let it sit for a while to dry. I did the same for the leaf, however I only had Peeled Paint distress ink and no other green inks to get some dimension. Then I took a Ranger manila tag and applied the Spiced Marmalade and Worn Lipstick inks on the tag and spritzed it with water too. I heat set it and let the inks move around while heating it. This is where I stray from the video. I was supposed to apply Gesso or white acrylic paint to the tag, but didn't have either, so I left it. 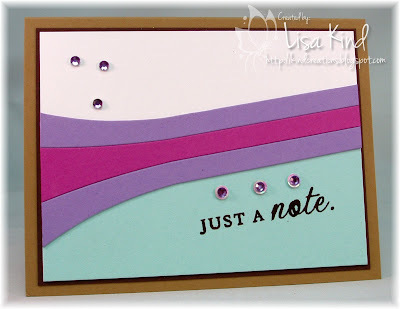 I then used a Dylusions stencil (from Ranger) and some pearl Modeling Cream to create this border. I used an old credit card to spread the modeling cream into the openings of the stencil. The results were so cool! Since the Modeling Cream was pearl, it really shimmers! Here's a side view of that. 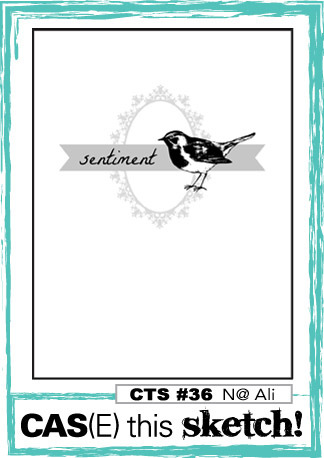 The sentiment is from PTI's Stylish Sentiments: Birthday and was stamped in Versafine Onyx Black. I added some seam binding to the hole. I'm entering this tag into our county fair in August. I was so excited about this technique that I decided to make a card for my friend's upcoming birthday. I did the same technique for the flower, leaf, and background paper. Except this time I covered the background paper with Picket Fence distress stain. It lightened it up and muted it a bit. 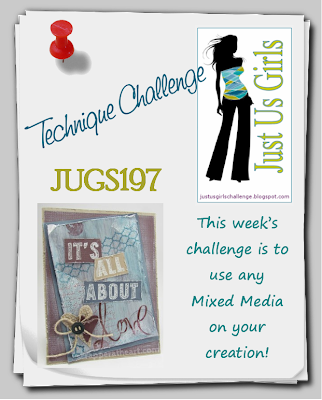 You have to check out these blogs to see what the JUGs design team did with this technique. 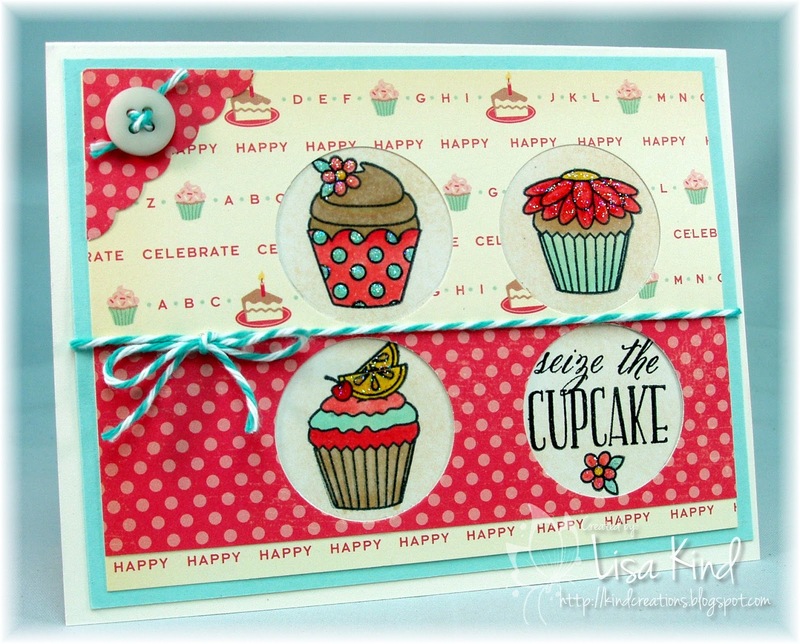 ETA: I'm also entering this in Moxie Fab World's Birthday Tags and Wraps Challenge! Perfect fit for my tag! 10 Minute Dash x 5! Like my title? 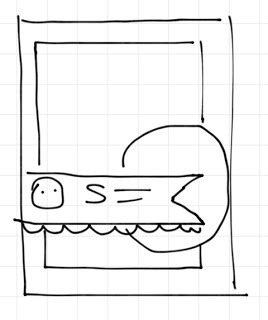 I'm taking the Summer Card Camp 2 from Online Card Classes and the challenge today was to create a card in 10 minutes or less. Well I failed miserably! I had my timer on and was on my way, but I hit the 10 minute mark and probably would have finished in about 12 minutes, but then the phone rang (my iPhone which is what I was using as my timer). Well, I forgot all about the challenge and kept on talking. When I hung up, I remembered the timer. It was at about 51 minutes! Hence the 10 x 5 in my title! Oh well! Here's my 51 minute card! I made this for my father-in-law who had some minor surgery this week and is in some discomfort. I like this sentiment from a Paper Smooches set called First Aid Kit. I stamped the bandage on Blush Blossom cardstock in Versamark then embossed it in white ep so that it looked like a bandage. 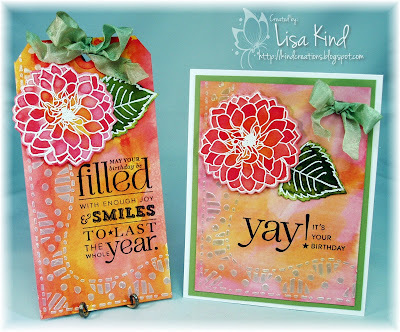 I stamped the heart (from Verve's Hearts on Fire set) in the middle with Dusty Durango ink. I cut it out and mounted it on the panel with dimensionals. 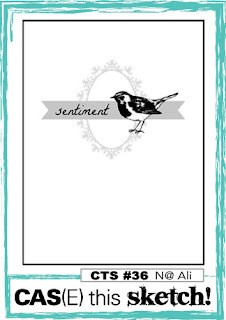 The sentiment, from the same PS set, was stamped in Memento cocoa ink. The dp is Basic Grey's Life of the Party. 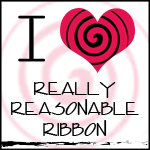 I added a piece of ribbon and a button threaded with some twine. 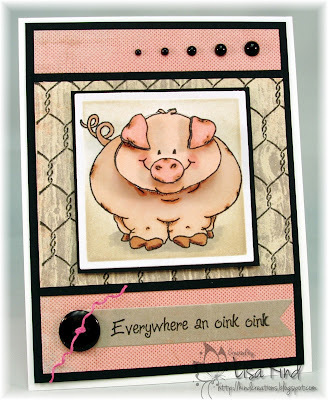 The main panel and the base of the card are Cajun Craze. I don't always finish off the inside of my cards until I need them so here is the finished off inside. I used First Aid Kit and Sentiment Sampler for the sentiments. The "and" is from PTI's Fresh Alphabet set. 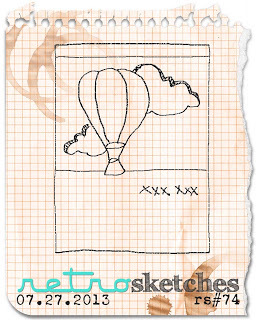 I used this Retro Sketch for my layout. 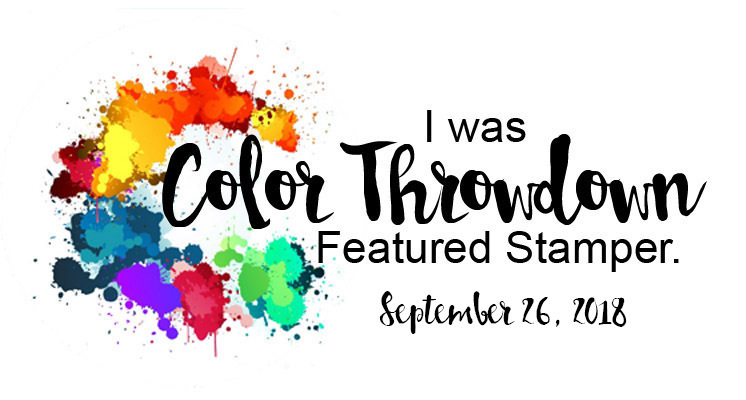 Happy 5th Birthday Color Throwdown! 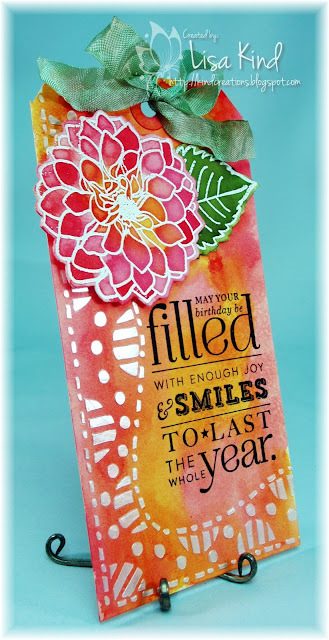 The Color Throwdown challenge blog is celebrating their 5th birthday! 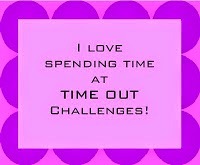 I think they are they are the longest running challenge blog around! I have the honor of being part of their celebration because I was a guest during October 2009. All past alumni and guests are celebrating this momentous occasion. 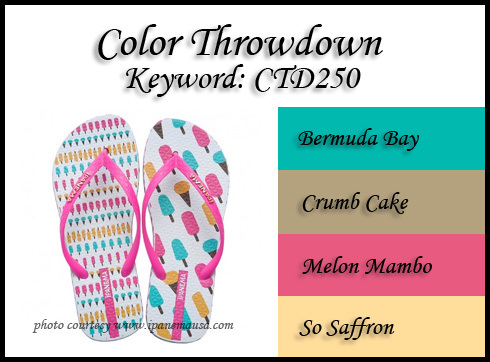 You can see all the participants on the Color Throwdown blog. While you are there, you can also see a list of prizes you can win if you play along this week! I'm told the list is very long! These are the fabulous colors chosen for this week. Love them! 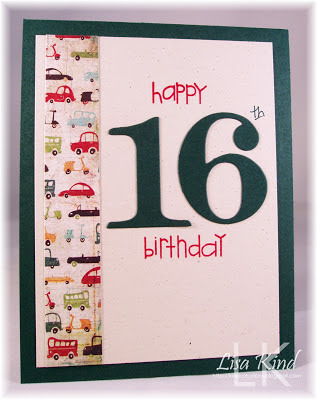 And when I saw the inspiration photo that the colors came from, I knew exactly the direction I was going with my card! I used this week's Mojo Monday sketch. I haven't played in their challenge in a while! So make sure you stop by the Color Throwdown blog and say happy birthday and then play along! You can't win if you don't play! Our friends got married yesterday and had a pig roast at their home. It was a casual wedding. 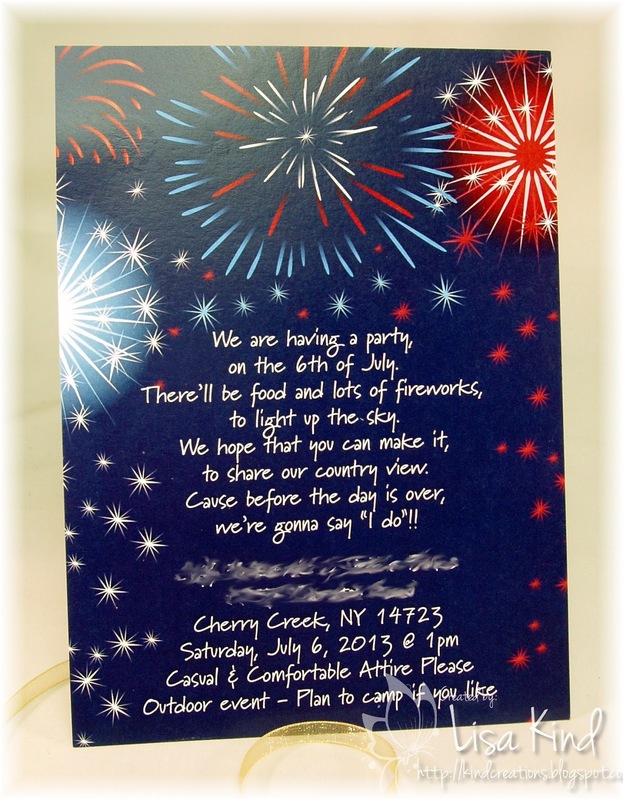 Here is their wedding invitation. I thought they were very cool, and I loved the poem on it. I also loved those fireworks! This invitation was my inspiration for their wedding card. I used a Lawn Fawn set called Happy 4th for the fireworks. I stamped them in Versamark and embossed them in red and gold. I thought I had blue ep, but I didn't, so I added navy pearls to the centers of the fireworks. 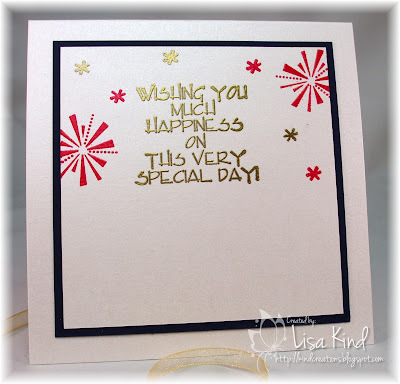 The sentiment, from SU's Heard from the Heart, was also stamped in Versamark and embossed in gold. 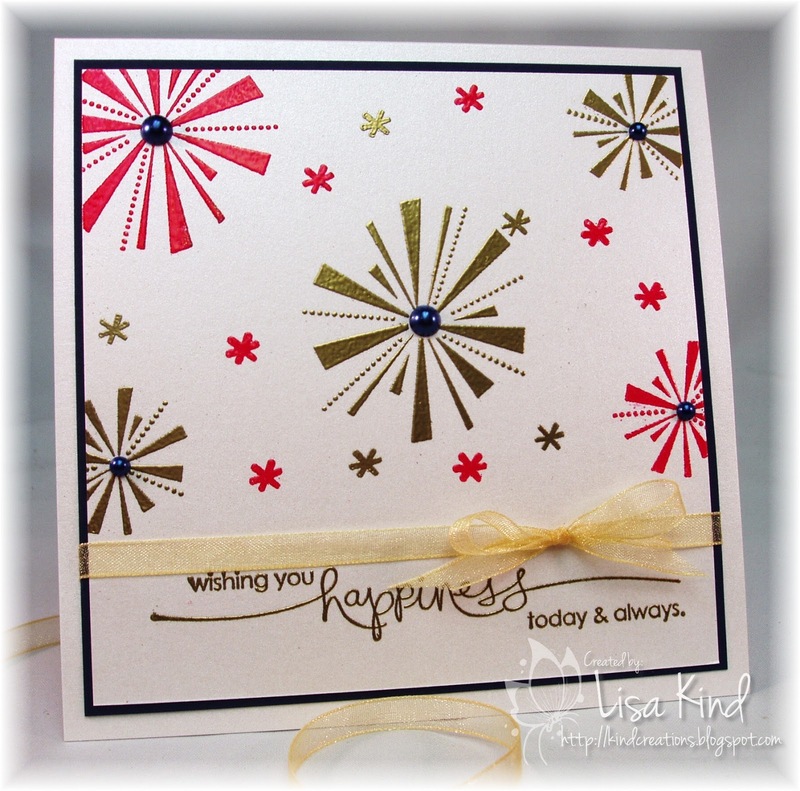 I added a sheer gold ribbon to separate the sentiment from the fireworks. The white paper is actually a shimmer white from PTI and it's mounted on navy cardstock. On the inside, I added this sentiment (I didn't write down who it was from) and more fireworks. 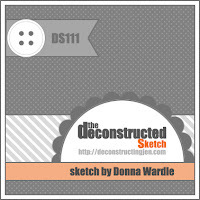 This week is sketch week over at Just Us Girls, and Nancy gave us this great sketch! I recently purchased this new set from WPlus9 called Sweets and Treats. 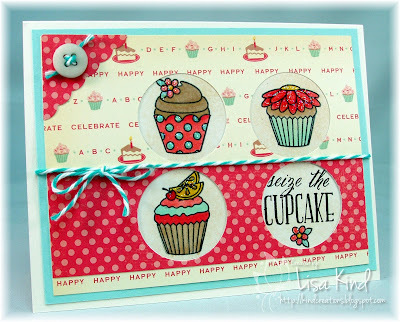 It's got all these cute cupcakes in the set, so I colored up these three and added them and the sentiment in the circles. I colored them to match the paper from October Afternoon called Cakewalk. 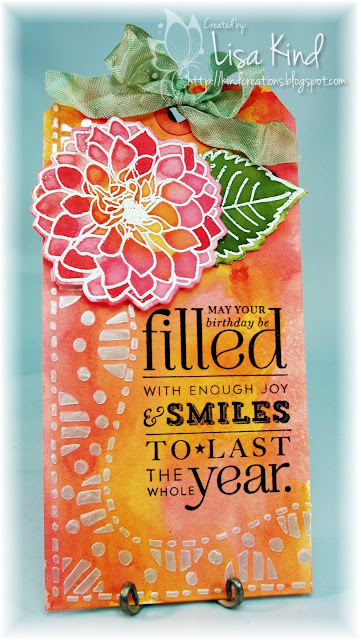 So many pretty designs to choose from in this paper pack! I added some Star Dust Stickles to the cupcakes and then some baker's twine and a button to finish it off. 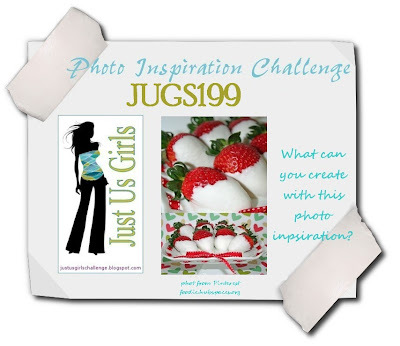 Stop by these blogs to see what the JUGs design team came up with. Hi all! Hope everyone had a nice 4th of July (if you are in the US!). We had a nice relaxing day at our cabin. A little rain in the afternoon, but it cleared up for the beautiful evening! 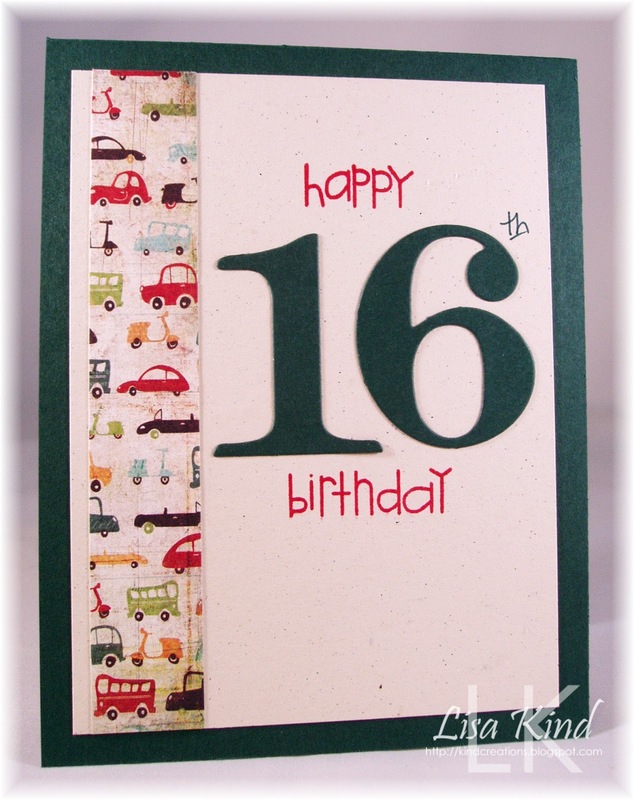 The card I made today is for our neighbors' son Kevin who turned 16 today. By 10:30 this morning he already had his driver's permit! Remember those days? So I had to make a special card for him that was driving-themed. The paper I chose is Basic Grey's Wander. 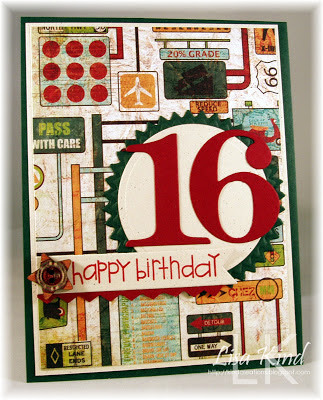 It had this cool collage paper with all sorts of road signs and such. I thought it would work well for my theme. 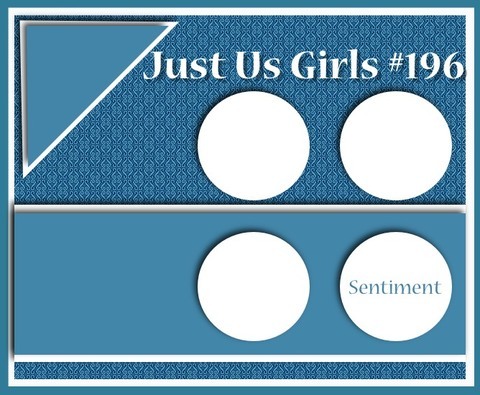 The numbers are from PTI's By the Numbers dies and the sentiment is from Sentiment Sampler from Paper Smooches. 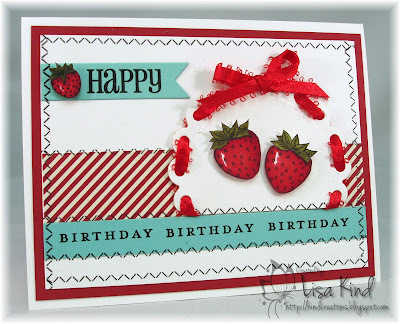 I originally used Handsome Hunter cardstock for the numbers, then changed my mind and went for the Cherry Cobbler instead. So instead of wasting the numbers, I put them inside. The car paper is also from Wander. Hope you are enjoying your summer! I know I am! Thanks for stopping by!